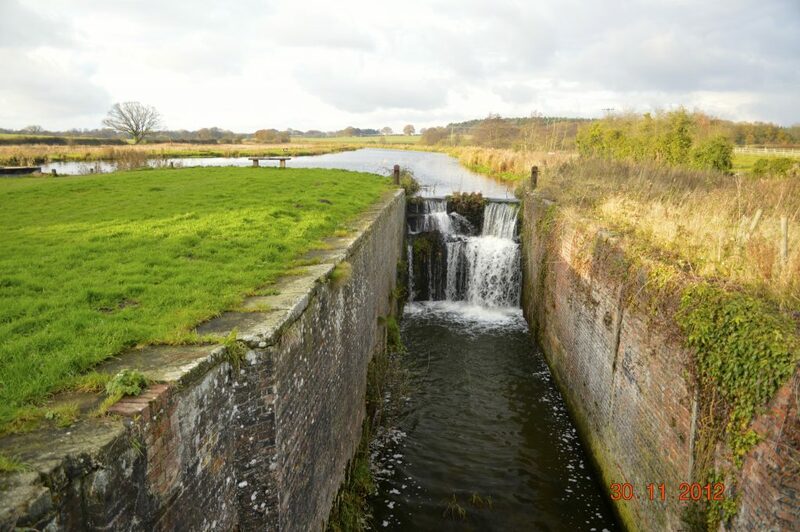 Work will start this summer on restoring Ebridge Lock, the best-known of the six along the North Walsham and Dilham Canal. 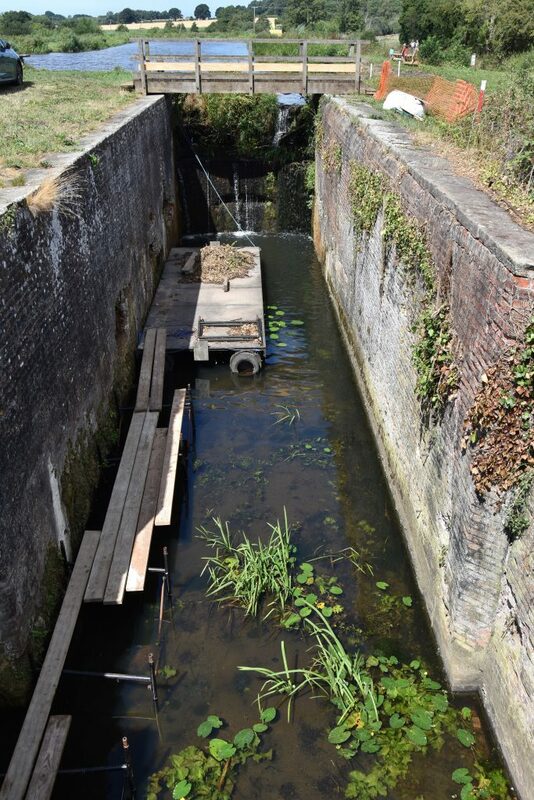 The project, estimated to cost up to £35,000, has been made possible thanks to a £26,000 EU LEADER grant to the North Walsham and Dilham Canal Trust which is working with the canal owners to regenerate the 19th-century waterway. The funding will cover the cost of manufacturing the top gates and “stop planks”, which block off the lock enabling repairs to be carried out. Volunteers will carry out the restoration with some professional help and the trust is appealing for donations to cover the cost of specialist contractors, materials such as bricks for the lock walls, and equipment hire. “The Ebridge Lock area has become a magnet for locals and tourists to walk, fish, boat or just sit since the Old Canal Company (OCC) restored the reach to Ebridge,” said trust chairman Ivan Cane. Bacton Wood Lock, one mile upstream, has been restored over a 10-year period by the OCC, which owns that stretch of the waterway, and volunteers. Once nearly nine miles long, the canal opened in 1826 to ferry cargoes to and from mills and communities along its route. But it went into decline with the arrival of the railway and the last wherry sailed it in 1934. Disuse led to the waterway becoming choked with vegetation and Ebridge Lock, along with the rest of the canal infrastructure, rusted, rotted and crumbled. It is the most visible of the canal’s locks, standing beside the road from North Walsham to Happisburgh, on Ebridge Mill Pond. 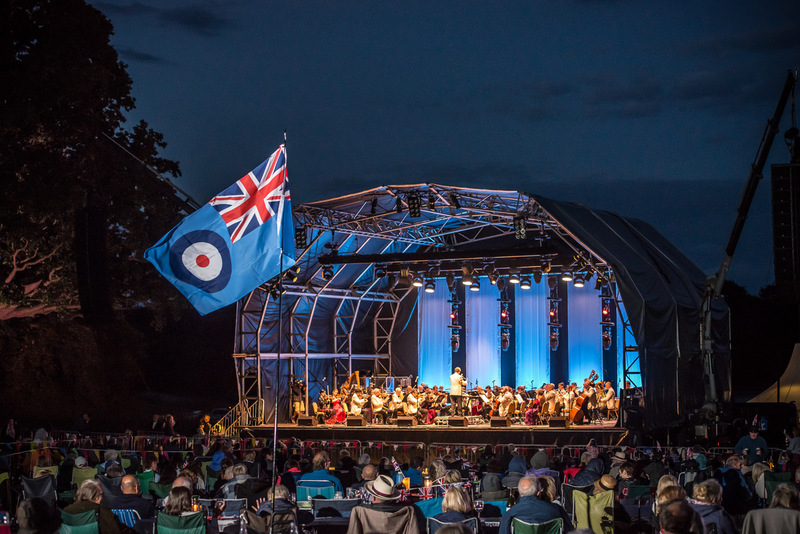 This entry was posted in Home Page, North Walsham, Uncategorized on April 9, 2019 by Just Regional. It is a milestone year for North Walsham’s War Memorial Hospital. For a century ago a public meeting sowed the seed for its creation. The hospital’s Friends group is asking for public help in tracking down information about that historic first gathering. And they are also using the 100th anniversary to recruit more members to carry on the tradition of community support for the much-loved health care unit. The original hospital was opened in August 1924, but its conception was five years earlier – as the nation recovered from the pain and carnage of the Great War. 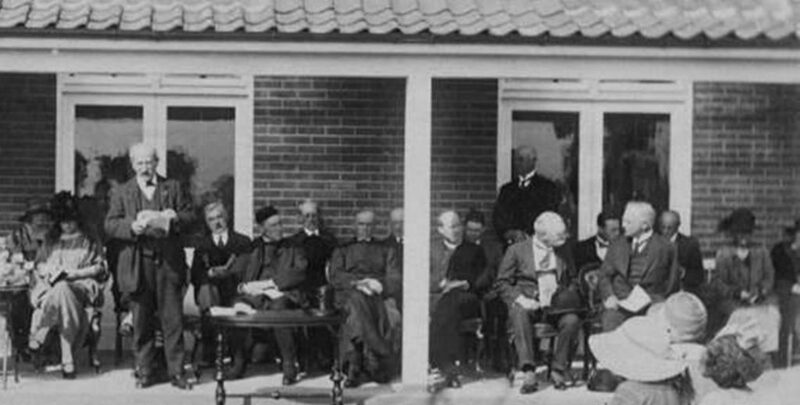 A meeting was held in 1919 to seek local people’s backing, and funding, for a “cottage” hospital. It aimed to care for the community’s sick and to remember the local soldiers who gave their lives in the war. Records of the meeting are scarce for the Friends would like to hear from anyone with local history or family archives which might shed a bit more light on that vital first meeting. Friends chairman Keith Jarvis said: “Our hospital was born through public support, and we are proud to carry on the tradition. “Even though the hospital is run by a health trust, the extras we provide make a difference to the lives of patients, families, friends and staff. We are looking for new members to support our efforts – and have some fun and friendship along the way. The foundation stone for the original hospital was laid on September 18 1919. The unit was opened in August 1924 by Princess Marie Louise. Today’s hospital, opened in 2012 after the original was demolished, is run by the Norfolk Community Health and Care NHS Trust. 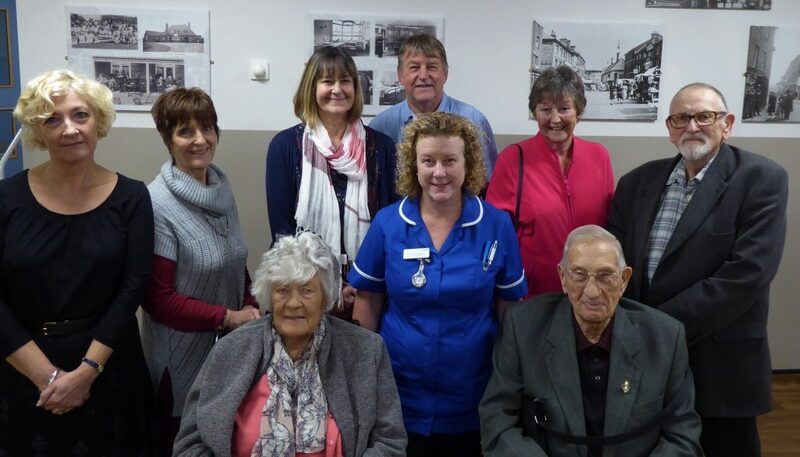 Thanks to continuing public donations the Friends pay for improvements and extras beyond the basic “health service” budgets – from a £22,000 revamp of the day room to Christmas gifts for patients. North Walsham mayor Barry Hester has already raised £2,850 for his civic charity, the town’s hospital League of Friends, which provides “extras” for patients, visitors and staff. 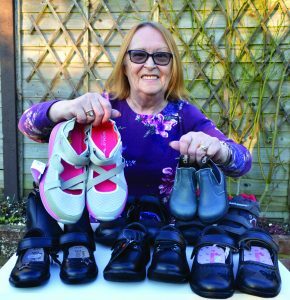 The latest boost to the funds comes from the gift of a dozens of pairs of shoes from local businesswoman Ann Bullimore, following the closure of her shop in the precinct. A range of children’s women’s and men’s shoes will be sold for the charity on Sunday, February 24, at the White Swan pub between 11am and 2pm. He is hoping to top £3,000 through the shoe sale, annual civic dinner in April and a planned comedy night in June. Deputy mayor Mary Seward with some of the shoes which will be for sale. This entry was posted in Home Page, North Walsham and tagged Charity, North Walsham, shoes. north walsham hospital on February 19, 2019 by Gay Webster. North Walsham High School will launch the sixth year of its mentoring scheme in February. Mentors take on between five and 10 Year 9 student mentees, and meet regularly with them over a two-and-a-half year period, to offer support and advice on qualifications, skills needed to progress towards their ambitions, and to help motivate and inspire them. Employers and business people who are interested in taking part are being invited to a business breakfast at the school to find out more. The event takes place on January 22, 7am-8.30am. Those interested in attending can reserve a place by contacting Kate Monday to Wednesday on 01692 402581 or by email on lawnk@nwhs.uk. 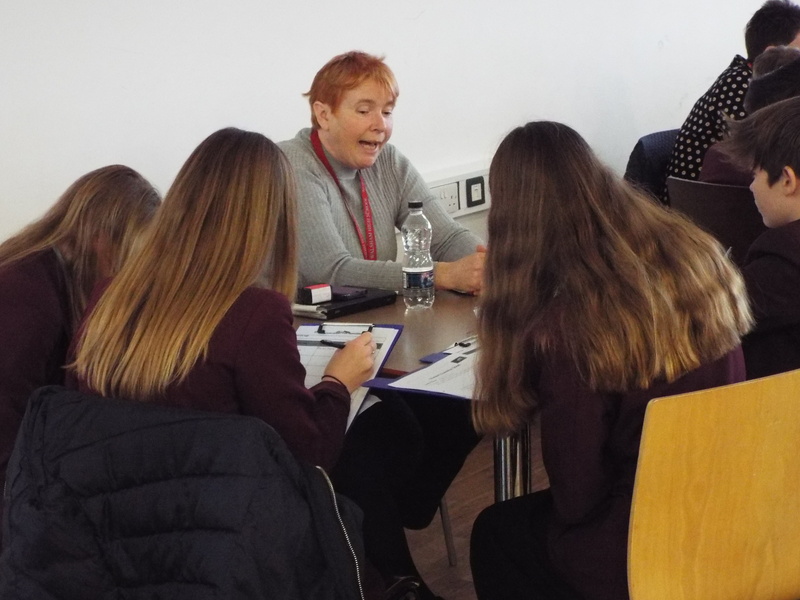 The 2019 scheme will be launched at a “speed networking” event at the school on February 13. Mentors receive training, and are required to complete a DBS check. This entry was posted in Home Page, North Walsham and tagged mentoring, North Walsham High School, work, work experience, young people on December 20, 2018 by Gay Webster. Plans for an artificial grass sports pitch in North Walsham were approved at a meeting of North Norfolk District Council’s cabinet. The facility, which would be available primarily for football, but with other sports depending on wider demand, will cost an estimated £860,000. It will be developed as a joint project between the council, the Football Foundation and North Walsham High School. The pitch will be available for both school and public use. The facility will be floodlit and fully enclosed, and provide improved parking and changing facilities on the school site. Under the proposals, the school will provide the land with North Norfolk District Council paying 40% of the capital cost, and the Football Foundation paying the remaining 60%. A feasibility study commissioned by the council identified an initial cost estimate of £810,000 for the pitch plus applications for funding, design and planning; plus another £50,000 to add a “shock pad” system so the facility can cater for other sports such as rugby. The latter £50,000 cost was not eligible for Football Foundation funding, meaning NNDCs contribution would be £374,000 and the Football Foundation contribution £486,000. North Norfolk District Council will submit a funding application for an April 2019 deadline, with a decision being made by the FA in July 2019 and completion before the end of 2019. The council will largely recoup its capital costs via user income. The income will also provide a fund for future renewal of the pitch surface which has an estimated lifetime of around 10 years. A council spokesman said: “We have been working with the Football Association (FA) for some time on this proposal and the need for the artificial grass pitch was clearly made. There is good demand from clubs locally and a particular emphasis on girls’ and women’s football. This entry was posted in Home Page, North Walsham and tagged North Walsham on December 17, 2018 by Just Regional.